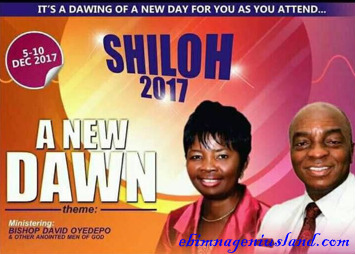 Shiloh is an annual program, mostly on prophetic and prayer gathering at the Winners Chapel International also known as Living Faith Church. The gatherings of the people of God at Shiloh in Winners Chapel international begins today being 5th of December 2017 and will be ending on the 10th of December 2017 at the Canaan Land Otta, Lagos State. The program has been tagged A NEW DAWN by the inspiration of the Holyghost given to the General Overseer, the founder and also called the President of living faith church. It was announced to those who won't be able to be there in Lagos state Otta precisely to locate any Winners Chapel church nearest to your place of dwelling to watch sessions of the programme via live streaming on the internet staring from 7:00 pm each day, 5:30am-6:30am daily, 7:00-11:00am daily till the last day being the 10th of December 2017. It will also be alongside ministration with the President of Living Faith Church by name Bishop David Oyedepo O. at the annual event progression, Which anchors the Presence of David Oyedepo Jnr.,Bishop Thomas Aremu and Bishop David Abioye as well as several other anointed ministers.